1 cup unsweetened almond milk + 1 tbsp. 1. Preheat oven to 400ºF and line 12 mufﬁn cups with paper liners. 2. In a large bowl, mix together the ﬁrst 5 ingredients. In another large bowl, combine the eggs and the brown sugar. Mix with a fork until smooth, then add all remaining ingredients except for the blueberries. Continue mixing until no lumps remain. 3. Gradually pour the wet mixture into the dry ingredients, and mix until just combined – don’t over-mix or the batter will make very tough mufﬁns! Finally, add the blueberries. 4. 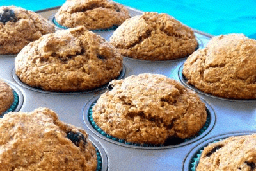 Scoop the batter into each mufﬁn cup, ﬁlling them to about ¾ full. Bake in the oven for about 20 minutes, or until a toothpick comes out clean. Let cool and enjoy! Can I leave out or substitute the bananas? Can I use yoghurt or milk instead of Almond milk? You can definitely use yoghurt or milk instead of the almond milk, but the bananas will be a bit more challenging to substitute because they add more moisture to the recipe. You could try a grated apple, applesauce, or a grated zucchini instead of the banana. Let us know how it turns out!